Leaking refrigerant. 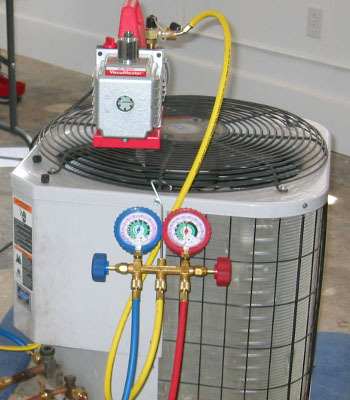 The refrigerant in an air conditioner should circulate in a leak-free, sealed system. If your air conditioner is running low on refrigerant, it is better to find and repair the leak than to add more refrigerant. Burned-out compressor motor. Have your system inspected if the motor starts to sound loud or different when it is running. Motor life can be shortened when other parts of the system are not maintained properly. Blocked condensate drain. In addition to adding cool air your air conditioner also removes humidity. The condensed water should drain, but if gets blocked an overflow switch will shut off the system. The condensate drain should be cleansed and cleared as part of regular maintenance. Blower problems. The blower does two jobs. It pushes conditioned air through ducts to your living area and also pulls an equal amount of indoor air back through its return ducts. An unbalanced fan, malfunctioning blower motor or faulty belt can cause problems with the way your system is operating. Inadequate maintenance. Dirty or clogged filters and coils will lessen the performance of your air conditioner and can eventually cause the compressor failure. Do not ignore symptoms of an air conditioning problem. It can cost more money in the long run and reduce the lifespan of your cooling system. We offer expert, quick-response AC repairs in the Rockford, Illinois area, so call us today for a free estimate. We thoroughly train our technicians to give our customers top notch quality service at affordable rates.